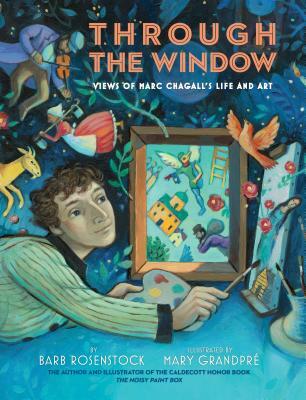 A gorgeous, expressive picture-book biography of Marc Chagall by the Caldecott Honor team behind The Noisy Paint Box. Through the window, the student sees . . .
His future--butcher, baker, blacksmith, but turns away. A classmate sketching a face from a book. His mind blossoms. The power of pictures. He draws and erases, dreams in color while Papa worries. A folder of pages laid on an art teacher's desk. Mama asks, Does this boy have talent? Pursed lips, a shrug, then a nod, and a new artist is welcomed. His brave heart flying through the streets, on a journey unknowable. Known for both his paintings and stained-glass windows, Marc Chagall rose from humble beginnings to become one of the world's most renowned artists. Admired for his use of color and the powerful emotion in his work, Chagall led a career that spanned decades and continents, and he never stopped growing. This lyrical narrative shows readers, through many different windows, the pre-WWI childhood and wartime experiences that shaped Chagall's path. From the same team behind the Caldecott Honor Book The Noisy Paint Box, which was about the artist Kandinksy, Through the Window is a stunning book that, through Chagall's life and work, demonstrates how art has the power to be revolutionary. BARB ROSENSTOCK is the author of the Caldecott Honor Book The Noisy Paint Box and Vincent Can't Sleep, also illustrated by Mary GrandPré, as well as The Camping Trip that Changed America, illustrated by Mordicai Gerstein, and Fearless: The Story of Racing Legend Louise Smith, illustrated by Scott Dawson. She lives outside of Chicago with her husband, sons, and two big poodles. Visit her at BarbRosenstock.com. MARY GRANDPRÉ is best known as the illustrator of the Harry Potter books. She also illustrated the Caldecott Honor Book The Noisy Paint Box, as well The Carnival of the Animals, written by Jack Prelutsky, and Chin Yu Min and the Ginger Cat by Jennifer Armstrong, amongst many others. Visit her at MaryGrandPre.com.